Rabbits are widely used to study the pharmacokinetics of intraocular drugs. We describe a method for conducting pharmacokinetic studies of intraocular drugs using rabbit eyes. Ahn, S. J., Hong, H. K., Na, Y. M., Park, S. J., Ahn, J., Oh, J., Chung, J. Y., Park, K. H., Woo, S. J. Use of Rabbit Eyes in Pharmacokinetic Studies of Intraocular Drugs. J. Vis. Exp. (113), e53878, doi:10.3791/53878 (2016). The intraocular route of drug administration enables the delivery of high concentrations of therapeutic drugs, while minimizing their systemic absorption. Several drugs are administered into the anterior chamber or vitreous, and the intraocular injection has been effective in curing various intraocular diseases. Rabbit eyes have been widely used for ophthalmic research, as the animal is easy to handle and economical compared to other mammals, and the size of a rabbit eye is similar to that of a human eye. 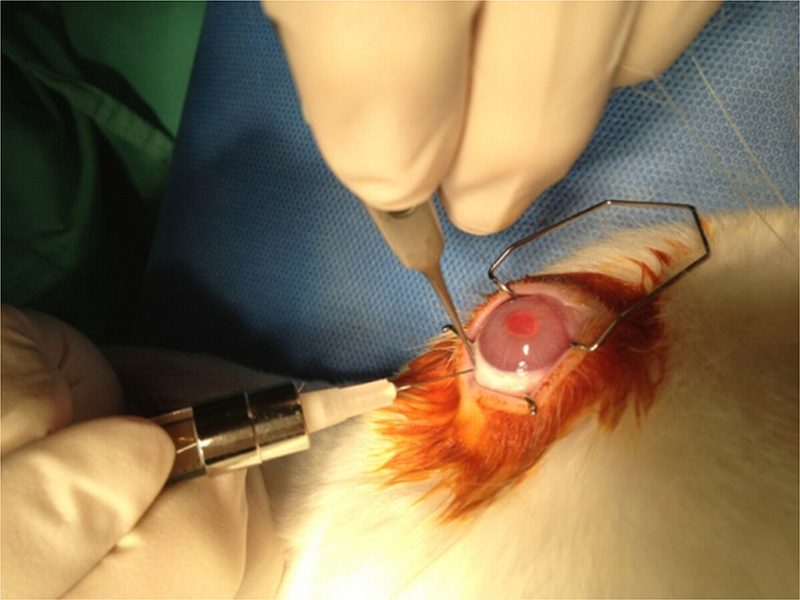 Using a 30 G needle, drugs can be injected into the intracameral and intravitreal spaces of rabbit eyes. 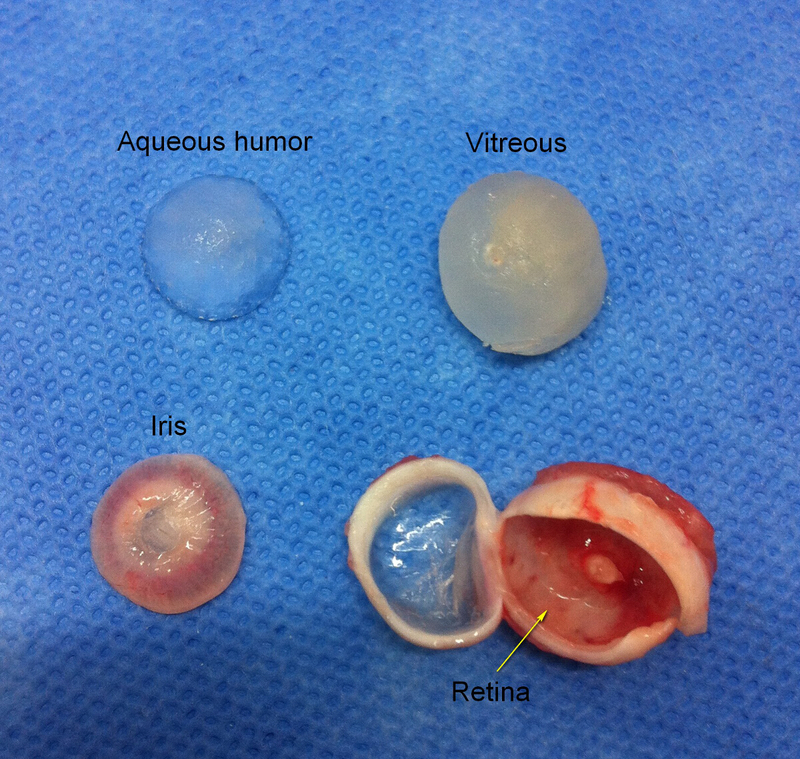 The eyeballs are then frozen until analysis, and can be divided into the aqueous humor, vitreous, and retina/choroid. The vitreous and retina/choroid samples can be homogenized and solubilized before analysis. Then, immunoassays can be performed to measure the concentrations of intraocular drugs in each compartment. Appropriate pharmacokinetic models can be used to calculate several parameters, such as the half-life and maximum concentration of the drug. Rabbit eyes can be a good model for pharmacokinetic studies of intraocular drugs. Before the advent of intraocular drug delivery, the main concern of medical therapy for intraocular diseases was the efficiency with which the drug could penetrate into the eye. The blood-ocular barrier prevents many substances, including drugs, from diffusing into the eye. Therefore, concentrations of drugs that are above therapeutic levels may not be easily obtained. The intraocular drug administration method, including intracameral and intravitreal injections, can directly bypass the blood-ocular barrier1-3, so that therapeutic concentrations of drugs can be achieved in the eye4,5. Accordingly, intravitreal drug delivery has become a popular method of treatment for several intraocular diseases5,6. For example, intravitreal injection is widely performed for age-related macular degeneration, diabetic retinopathy, retinal vein occlusions, and intraocular infections7-10. In particular, since the introduction of anti-VEGF medications, the frequency of intravitreal injections has remarkably increased for the treatment of retinal diseases. Therefore, it is important to understand the intraocular pharmacokinetics of such drugs for evaluating the efficacy and safety of the medical therapy. Although the intraocular administration of drugs is considered a major breakthrough in medical therapy for ocular diseases, monitoring the drug concentration within the eyeball is technically demanding. Because human eyes contain only small amounts of aqueous humor (about 200 µl) and vitreous (about 4.5 ml, Table 1), it is technically difficult to obtain sufficient amounts of ocular fluid to measure the drug concentration. Furthermore, methods that are used to obtain the eye fluid, such as vitreous tapping or anterior chamber paracentesis, may damage the ocular tissue and result in serious complications, such as cataracts, endophthalmitis, or retinal detachment11,12. Accordingly, animal models are used in pharmacokinetic studies of commonly used intraocular drugs13. Among these animal models, rabbits or monkeys are the most frequently used animals. Rabbits, which are small mammals of the order Lagomorpha in the family Leporidae, are found in several parts of the world. Because rabbits are not aggressive, they are easy to handle, use in an experiment, and observe. Lower cost, ready availability of the animal, similar eye size to humans, and a large database of information for comparison favor performing pharmacokinetic studies using rabbit eyes. In this paper, a protocol for pharmacokinetic studies of intraocular drugs in rabbit eyes is described. Our protocol follows the guidelines of the Institutional Animal Care and Usage Committee (IACUC) of Seoul National University Bundang Hospital, which approved all of the animal procedures and animal care methods presented in this protocol. The IACUC is in full compliance with the eighth edition of Guide for the Care and Use of Laboratory Animals (2011). All procedures were performed with adherence to the guidelines of the Association for Research in Vision and Ophthalmology Statement for the Use of Animals in Ophthalmic and Vision Research in animals. Individual cages were used for housing the rabbits. Additional surgery or preparation before carrying out this experiment (i.e., sterilization) may not be required. Anesthetize healthy New Zealand white rabbits weighing 1.5-2 kg with an intramuscular injection of a mixture of tiletamine hydrochloride and zolazepam hydrochloride (15 mg/kg) and xylazine hydrochloride (5 mg/kg). Verify anesthesia by monitoring the palpebral (blink) reflex or by ear pinch. NOTE: If an intraocular drug binds to ocular pigments, the degree of binding might induce modification of the drug's ocular pharmacokinetics. For example, the half-life of a pigment-binding drug in the vitreous and aqueous humors of pigmented rabbits may be increased compared to that in albino rabbits14. In this case, the data obtained from pigmented rabbit eyes may be more similar and applicable to human eyes as human eyes have a different degree of pigmentation and albino rabbit eyes may not represent human counterparts. Thus, considering drug-pigment interaction, the use of pigmented or albino rabbits should be carefully considered and the results should be interpreted together with the strain (pigmentation) of rabbit. However, albino rabbits are recommended for use in studies comparing pharmacokinetic properties as the drug-pigment interaction may be a confounding factor in the comparison. Apply a topical anesthetic with 1% proparacaine hydrochloride ophthalmic eye drops. Use vet ointment (2% hydroxypropyl methylcellulose) to prevent eye dryness until recovery from anesthesia. NOTE: Never leave the rabbit unattended while anesthetized. Dilate the pupil with one or two drops of phenylephrine hydrochloride and tropicamide. For surgical preparation before the intraocular injection, apply 5-10% povidone-iodine to the periocular skin with a cotton swab5. Place one drop of 5-10% povidone-iodine on the conjunctiva of the eye. Administer the intraocular drugs either intravitreally or intracamerally using aseptic techniques5. NOTE: The drug absorbed in systemic circulation may also penetrate the fellow eye. When a drug is administered to both eyes, the drug concentration in one eye may be affected by drug injected into the other eye. If it is confirmed that the effect of the contralateral injection can be neglected as the drug in systemic circulation cannot penetrate the other eye, the use of both eyes for intraocular injections can be considered, as it is economical and minimizes the number of animals sacrificed for the pharmacokinetic studies. For pharmacokinetic study on systemic concentration following intraocular injection, the use of only one eye is appropriate. For intravitreal injections, inject the drug intravitreally 1 mm behind the surgical limbus in the superotemporal quadrant using a 30 G needle and either commercial 1 ml syringes, insulin syringes, or glass syringes perpendicularly to the scleral surface5. NOTE: The volume of drug used for intracameral and intravitreal injection varies depending on the drugs under investigation. For pharmacokinetic experiments on anti-VEGF agents using rabbit eyes, previous studies used 0.025, 0.05 (most common), or 0.1 ml of bevacizumab or ranibizumab for the intracameral or intravitreal injection. In our previous studies on intraocular pharmacokinetics of anti-vascular endothelial growth factor, 0.05 ml of bevacizumab15, 0.025 ml of ranibizumab, or 0.03 ml of VEGF-Trap16 were used. The largest safe volume without paracentesis is believed to be 0.1 ml, although there has been little evidence to support this17. If excessive volume is injected either intracamerally or intravitreally, intraocular pressure is greatly increased. In addition to optic nerve damage directly caused by increased intraocular pressure (IIOP), namely glaucomatous optic nerve damage, in extreme cases the IIOP leads to impaired ocular perfusion and central retinal artery occlusion, which is analogous to stroke in the brain. For intracameral injections, inject the drug into the anterior chamber by inserting a 30 G needle through the corneoscleral limbus with the bevel up and advancing it parallel to the iris plane to minimize the risk of trauma to the iris or lens. NOTE: Depending on the drug formulation, needles larger than 30 G can be used. The conditions requiring larger-gauge needle include drugs containing microspheres, large-protein drugs, and high viscosity formulations. After injection, compress the injection site with a sterile cotton-tip applicator to promote wound healing. NOTE: Normally, 30 sec is enough for wound healing, when a 30 G needle is used for intraocular injection. However, if a larger gauge needle is used for intraocular injection, longer time would be appropriate for wound sealing to minimize the leakage from the sclerotomy wound. To check for sclerotomy wound leakage is important to ensure that the amount of intraocular drug used immediately after the intraocular injection is the same as the injected amount, especially if a larger gauge needle is used. Observe the treated rabbits daily for one week, and once a week afterwards, for any sign of severe intraocular inflammation (conjunctival injection and hypopyon) until euthanasia. NOTE: Analgesics after injection are not required as intraocular injection using a 30 G needle is a minimally invasive procedure that is not accompanied by post-surgical pain. Do not return an animal that has undergone surgery to the company of the other animals until fully recovered. For enucleation, euthanize the rabbits at various time points (e.g., 1 hr or 1, 2, 5, 9, 14, or 30 days) after the intraocular drug injection. NOTE: These time points depend on the drug of interest and the known pharmacokinetic profiles. For each time point, use at least two eyeballs13. For reliable data quality, sampling time should be chosen carefully, at least four time-points with balanced sampling for at least a time-span of two half-lives of the drug13. We believe that 6-8 time-points with balanced sampling may be appropriate. For small molecules (≤1,000 Da)18, in particular, more than 1 time-point during the first 24 hr is crucial. Accordingly, for macromolecules (>1,000 Da)18, a sampling period such as 1 hr and 1, 2, 5, 9, 14, and 30 days19 can be a good option. For small molecules (≤1,000 Da), 1, 2, 4, and 8 hr and 1, 3, and 7 days can be one option20. Depending on the molecular weight, the sampling period can be further modified. For euthanasia, administer 10 ml of 15% intravenous KCl rapidly after anesthetizing rabbits with an intramuscular injection of a mixture of tiletamine hydrochloride, zolazepam hydrochloride (15 mg/kg), and xylazine hydrochloride (5 mg/kg). Open the palpebral fissure with an eyelid retractor. Make a 360° conjunctival incision 2-3 mm posterior to the limbus and extend it posteriorly by dissecting the conjunctiva and Tenon's capsule from the globe. Cut the extraocular muscles close to their insertion into the globe. Clamp the optic nerve with curved forceps and then cut the nerve between the forceps and the globe. Remove the eyeball itself while leaving the surrounding tissues intact. After enucleation, immediately freeze the eyeballs and store them at -80 °C. NOTE: There may be two options for immediate freezing. If the drug concentration is measured at a very early phase (i.e. less than 1 hr), liquid nitrogen may be more appropriate to ensure better timely freezing of the eyeball. However, for subsequent periods, ice can be used to cool the eyeball immediately, and then deep freezer can be used to store the eyeballs at -80 °C. After obtaining the eyeballs for all of the time points, separate the frozen eyeballs into three compartments, the vitreous, the aqueous humor, and the retina/choroid. Separate these compartments before defrosting. NOTE: The most important point for the separation into three compartments is the speed of the procedure. The eyeball should be separated very quickly before defrosting and the procedure can be performed on the ice to delay thawing. To open the globe, make an incision at the corneal limbus (300° or greater) with a scalpel blade. Obtain the frozen compartment in front of the iris, the aqueous humor. Remove the frozen iris and lens by pulling and excoriating using tissue forceps. When the vitreous becomes accessible, obtain the frozen vitreous by separating it from the remaining tissues (retina/choroid/sclera). Using a No. 15 scalpel blade, separate the retina/choroid tissue from the underlying sclera. For immunoassays, defrost the aqueous humor samples, and measure the volume of each sample. Measure the weight of the frozen samples by subtracting the weight of an empty tube from that of the tube containing the frozen sample. NOTE: Because the specific gravity of the frozen samples is approximately 1, the weight of each sample can be used to calculate the volume of the sample. Weigh the vitreous samples, defrost the samples, and solubilize them in 1.0 ml of phosphate-buffered saline containing 1% bovine serum albumin on a rotator overnight at 4 °C. Then, centrifuge the samples at 387 x g for 10 min21. Weigh the frozen retina/choroid samples for homogenization. Add protein extraction reagent with a ratio of tissue to reagent of 1:10 (1 g of tissue/10 ml of reagent). Homogenize the tissue using a pre-chilled microhomogenizer. Centrifuge the lysed sample for 10 min at 12,000-20,000 x g and transfer the supernatant to a chilled EPP tube. NOTE: Several analytical methodologies can be used for the measurement of protein concentration. Choose an appropriate quantitative method, depending on the detection range. Briefly, the selected ion monitoring mode of HPLC can detect picogram levels of molecule, whereas LC-MS/MS can detect nanogram and picogram levels of protein for profiling with MRM/PRM mode, respectively. The detection limit of ELISA is considered to be at the picogram level. For the indirect enzyme-linked immunosorbent assays (ELISAs) to measure concentrations of anti-VEGF agents, use ELISA kits in 96-well plates to detect the drug of interest and generate a standard curve of known drug concentrations. Dilute the vitreous, the aqueous humor, and the retina/choroid samples with 0.1% bovine serum albumin in 1x phosphate-buffered saline (PBS) to concentrations that are within the linear range, and use these for the assay. 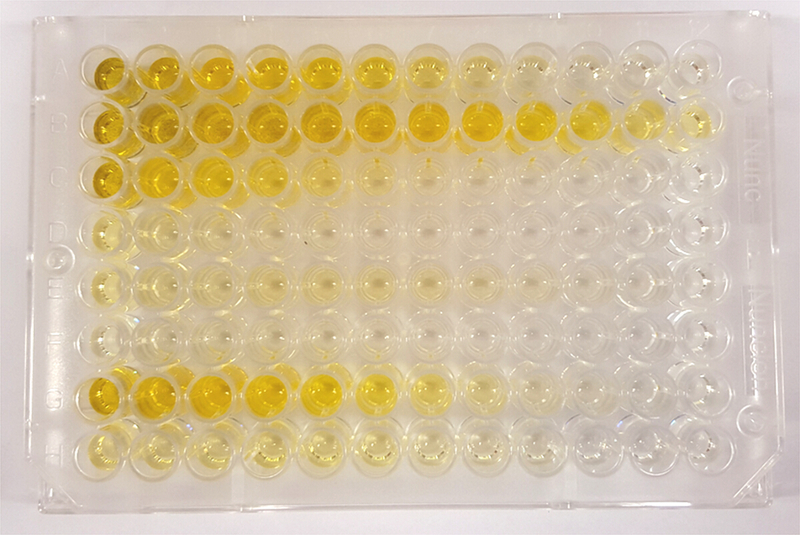 Divide the samples into aliquots on the plate at 100 µl/well. Incubate overnight at 4 °C and then wash the plate three times using 200 µl of the washing solution of 0.05% Tween20 in 1x PBS. NOTE: The anti-VEGF present in the sample acts as the primary antibody for ELISA; therefore, additional use of a primary antibody is not necessary. Dilute the secondary antibody to 1:20,000 in 0.1% BSA in 1x PBS, and add 100 µl of the diluted-solution per well. After incubating the plate with a diluted secondary antibody overnight at 4 °C, measure the optical density at 450 nm wavelength. Subtract the average zero standard optical density from the average of duplicate readings for each standard and sample. Create a standard curve based on the relative light signal from solutions of the drug with known concentrations by reducing the data using computer software capable of generating a four-parameter logistic (4-PL) curve fit, such as SoftMax Pro. For creating a standard curve, the 4-PL curve fit can be obtained by clicking on [4-parameter] in [Standard Curve] - [Fit]. Calculate the drug concentration in the samples from the standard curve. NOTE: The limits of detection (LOD) of anti-VEGF drugs were investigated in our experiment. The LOD of bevacizumab was 0.024-3.125 ng/ml and that of aflibercept was 0.039-10 ng/ml. NOTE: For PK analysis, one can use either compartmental or non-compartmental analysis. In compartmental analysis, disposition behavior of molecules can be explained by an equation (model). Thus, compartmental PK analysis can predict the concentration at any time t whereas the non-compartmental model cannot visualize or predict concentration-time profiles for other dosing regimens. However, fitting of compartmental models can be a complex and lengthy process. In contrast, assumptions are less restrictive in non-compartmental model. The non-compartmental method is simple and used commonly to calculate pharmacokinetic parameters such as half-life, clearance, and volume of distribution. We chose compartmental models for pharmacokinetic studies on anti-VEGF agents. Analyze the drug concentration data with the compartmental models using modeling software such as Phoenix WinNonlin software. Click [PK model] in [WNL5 classic modeling] and map the observation time, administered dose, and drug concentration in the [Setup] menu. Select compartmental model (e.g., number of compartments) in the [model selection] tab, and click the [Execution] button to calculate model parameters. After the analyses, select the final compartment model that best describes the drug concentration data based on the following criteria: (1) Akaike Information Criterion, (2) precision of parameter estimates (e.g., standard error), and (3) graphical analysis (e.g., goodness of fit plots). Calculate pharmacokinetic parameters of interest, such as half-life (T1/2) and area under the time-concentration curve (AUC), from the model parameters and equations driven by the compartmental model. The procedure that is used to conduct intravitreal injections of a drug of interest in rabbit eyes with sterile techniques is shown in Figure 1. The treated eyes are enucleated at a scheduled time and stored at -80 °C. For the analysis, three compartments, the aqueous humor, the vitreous, and the retina/choroid, are separated from the frozen rabbit eyes, as demonstrated in Figure 2. Samples of the compartments are prepared for the ELISA. After incubation with a secondary antibody, optical density is measured in a 96-well plate, which contains known concentrations of the drug of interest for the standard curve and samples from the three compartments that were collected at multiple time points after the intravitreal injection (Figure 3). The concentration data that is calculated from the standard curve (Supplementary Figure 1) can be fitted to the pharmacokinetic model, and the pharmacokinetic parameters can be determined from the fitted line (Figure 4). In Figure 4, pharmacokinetics of intravitreally injected bevacizumab in vitrectomized and non-vitrectomized eyes were evaluated and compared. Compartmental PK analysis was performed, which provided the following equation to explain PK behavior. As shown in Figure 4, the estimated concentration according to the fitted model matched quite well to the actual measured values. There were no significant differences in vitreous concentration of bevacizumab and pharmacokinetic parameters such as half-life between with and without vitrectomy. 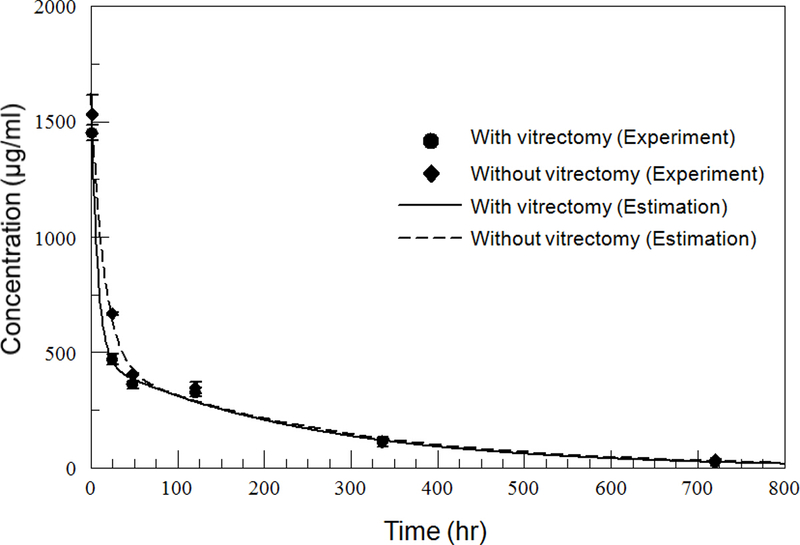 This experiment suggests that the role of the vitreous in the distribution and clearance of bevacizumab is insignificant. Figure 1: Procedure for Performing Intravitreal Injections of Intraocular Drugs in the Rabbit Eye Under Anesthesia. Aseptic techniques are used by applying 5% povidone-iodine drops and by skin preparation, and the intravitreal injection of the drug of interest is performed using a syringe fitted with a 30 G needle. Please click here to view a larger version of this figure. Figure 2: Separation of the Frozen Rabbit Eyeball into Three Compartments. Following scleral incision with a surgical blade and removal of the iris, the aqueous humor and vitreous can be separated. Subsequently, the retina/choroid can be separated carefully from the sclera, which is the white outer layer of the eyeball. Please click here to view a larger version of this figure. Figure 3: Enzyme-linked Immunosorbent Assay (ELISA) of the Intraocular Drug in the Samples Representing the Three Compartments. This figure shows a 96-well plate, which is used for the immunoassay. After incubation with a secondary antibody, a color change is noted in the wells. The optical density of the color depends on the concentration of the drug of interest. Please click here to view a larger version of this figure. Figure 4: Fitting the Observed Data to the Pharmacokinetic Model. In this experiment comparing the pharmacokinetics of bevacizumab in vitrectomized and non-vitrectomized eyes, the actual intravitreal concentration of bevacizumab is presented as dots. The fitted curves for the concentration data that are driven by the pharmacokinetic model, which are represented by two lines, are drawn and used for the calculation of pharmacokinetic parameters, such as the half-life of the drug. Error bars indicate 95% confidence intervals. Please click here to view a larger version of this figure. Supplementary Figure 1: The Standard Curve of the ELISA Used for Detection of Bevacizumab. This is obtained using the software capable of generating a four-parameter logistic curve fit. Please click here to download this file. Table 1: Vitreous and Aqueous Humor Volume in Different Species17,22-30. With the increasing use of intraocular drugs, such as anti-vascular endothelial growth factor (VEGF) agents, for the treatment of diverse ocular diseases, knowledge of the tissue distribution and clearance of the drug after the intraocular injection is important. Understanding the pharmacokinetics of intraocular drugs is important for understanding the efficacy and safety of drugs, determining the optimal dosage of the drugs, and minimizing systemic or intraocular complications. However, detailed pharmacokinetic studies of intraocular drugs in humans are limited owing to safety issues, and an appropriate animal model is necessary. The rabbit system is a well-established model that is used to study the intracameral, intravitreal, and intraretinal pharmacokinetics of intraocular drugs16,21,31-33. Rabbits are easy to handle and use in experiments. In addition, animal studies that use rabbits are very economical as compared to those that use larger animals such as monkeys. For pharmacokinetic studies, this system allows the simultaneous sampling of the aqueous fluid, whole vitreous, retina, and serum from the same rabbit, and at different time points in different rabbits. Furthermore, rabbit eyes can be prepared to simulate treated human eyes, such as vitrectomized eyes, thus allowing pharmacokinetic studies under specific conditions15,19. With this model, researchers can analyze the effects of specific modulations or eye conditions to the pharmacokinetic properties of intraocular drugs. For example, previous studies of anti-VEGF agents in vitrectomized and non-vitrectomized eyes suggested that the removal of the vitreous by a vitrectomy does not affect the intraocular pharmacokinetics of anti-VEGF agents15,19. Our protocol consists of intraocular injection of the drug into the rabbit eyes, sample preparation, immunoassay, and pharmacokinetic analysis methods. Among these, the critical step within this protocol is sample preparation. Separation of the frozen eyeball into three compartments is not easy if the eyeball is thawed. Although the details of the separation are described in this protocol, quick separation of the three compartments while keeping the tissue frozen is the key step for successful partition. It is also possible to modify the sample preparation. For example, anterior chamber samples can be obtained by paracentesis of aqueous humor34,35. Vitreous sample can be also obtained by tapping35, which has not been used commonly owing to high failure rate and the possibility of tissue disruption. For the sample preparation of the retina, retinal tissues can be dissected into two layers with Ames solution36. The second important point is to determine the appropriate time-points at which to sacrifice rabbits and enucleate the eyeballs. We suggest 1 hr, and 1, 2, 5, 9, 14, and 30 days as sampling time points for large protein drugs, such as bevacizumab or ranibizumab. The half-life of an intravitreal drug depends primarily on its molecular weight. If the half-life of a drug of interest is expected to be shorter or longer than that of bevacizumab or ranibizumab, the sampling time points should be adjusted accordingly. Third, using one eye or both eyes of a rabbit is sometimes a matter of concern. Although the systemic absorption of an intraocular drug is usually minimal, intravitreal drugs can move to the contralateral eye and bias the result. Thus, the use of both eyes should be limited to performing a paired comparison of pharmacokinetics of two different drugs in the same animal or to comparing one single drug under two different ocular conditions (such as vitrectomized eyes). Fourth, we used ELISA, an immunologic assay, to measure the concentration of protein drugs. To measure the concentration of chemical drugs, high-performance liquid chromatography (HPLC) can be used. Multiple-reaction monitoring (MRM) using mass spectrometry is a recent quantitative method for analysis of proteins and peptides with high selectivity and sensitivity. If no reliable antibody-based assay is available for specific drugs, MRM can be a good alternative. One limitation of the method is that the differences between rabbit and human eyes could result in altered pharmacokinetics in the rabbit as compared to humans. In particular, humans have a vitreous cavity with a larger volume (4.5 ml) than that of rabbits (1.5 ml)21. In addition, because humans have a larger serum compartment than rabbits, the systemic exposure may be decreased. Furthermore, in humans, the vitreous becomes more liquefied and less homogenous with aging, which is associated with increased convective flow in the vitreous37. Therefore, liquefaction and convection in the vitreous have been suggested to be major pharmacokinetic differences between the rabbit and human38. These differences should be carefully considered when extrapolating the drug pharmacokinetic properties that are obtained from animal studies to humans. Another limitation is that this method measures the intraocular drug concentration in different animals. There might be differences in size, pharmacokinetic properties, and ocular and systemic conditions among rabbits in an experiment. To determine accurate pharmacokinetics, repeated longitudinal measurements in the same animal are preferable to using different animals. An alternative method is to use radioisotope-labeled drugs and measure the concentration with PET scans39. However, the PET scan usually has wide measurement deviations, and it is considered inappropriate for accurate measurement of low concentrations. A recent technology of intravital imaging could be a future research tool to overcome this limitation, for intraocular pharmacokinetic study40. As more drugs are developed for intravitreal injection, the need for intraocular pharmacokinetic studies will increase. In addition, various drug delivery systems such as fluocinolone acetonide intravitreal implant41-43 and dexamethasone intravitreal implant44,45, are being developed and the prediction of intraocular drug retention would be as important as intravitreal injection itself. Likewise, this protocol can be applied to other ocular delivery routes, such as topical, subconjunctival, and suprachoroidal46 administration. In addition, it can be applied to investigating the pharmacokinetics of long-term sustained intraocular drug-delivery systems, such as PLGA implants47, hydrogels, and microparticles. We believe that this protocol for the pharmacokinetic study of intraocular drugs using rabbit eyes will be useful to many researchers in ophthalmological fields. We would like to thank Ms. Ji Hyun Park and Ji Yeon Park for their technical assistance in the animal experiments. This work was supported by a grant from the Seoul National University Bundang Hospital Research Fund (grant number: Grant No. 14-2014-022) and from a grant (CCP-13-02-KIST) from the Convergence Commercialization Project of the National Research Council of Science and Technology, Seoul, Korea. Urtti, A. Challenges and obstacles of ocular pharmacokinetics and drug delivery. Adv Drug Deliv Rev. 58, 1131-1135 (2006). Geroski, D. H., Edelhauser, H. F. Drug delivery for posterior segment eye disease. Invest Ophthalmol Vis Sci. 41, 961-964 (2000). Ghate, D., Edelhauser, H. F. Ocular drug delivery. Expert Opin Drug Deliv. 3, 275-287 (2006). Del Amo, M. E., Urtti, A. Current and future ophthalmic drug delivery systems. A shift to the posterior segment. Drug Discov Today. 13, 135-143 (2008). Avery, R. L., et al. Intravitreal injection technique and monitoring: updated guidelines of an expert panel. Retina. 34, Suppl 12. S1-S18 (2014). Kim, Y. C., Chiang, B., Wu, X., Prausnitz, M. R. Ocular delivery of macromolecules. J Control Release. 190, 172-181 (2014). Group, C. R., et al. Ranibizumab and bevacizumab for neovascular age-related macular degeneration. N Engl J Med. 364, 1897-1908 (2011). Campochiaro, P. A., et al. Sustained benefits from ranibizumab for macular edema following central retinal vein occlusion: twelve-month outcomes of a phase III study. Ophthalmology. 118, 2041-2049 (2011). Brown, D. M., et al. Ranibizumab for macular edema following central retinal vein occlusion: six-month primary end point results of a phase III study. Ophthalmology. 117, 1124-1133 (2010). Diabetic Retinopathy Clinical Research Network. Aflibercept, bevacizumab, or ranibizumab for diabetic macular edema. N Engl J Med. 372, 1193-1203 (2015). McCannel, C. A. Meta-analysis of endophthalmitis after intravitreal injection of anti-vascular endothelial growth factor agents: causative organisms and possible prevention strategies. Retina. 31, 654-661 (2011). Meyer, C. H., et al. Incidence of rhegmatogenous retinal detachments after intravitreal antivascular endothelial factor injections. Acta Ophthalmol. 89, 70-75 (2011). Del Amo, E. M., Urtti, A. Rabbit as an animal model for intravitreal pharmacokinetics: Clinical predictability and quality of the published data. Exp Eye Res. 137, 111-124 (2015). Hughes, P. M., Krishnamoorthy, R., Mitra, A. K. Vitreous disposition of two acycloguanosine antivirals in the albino and pigmented rabbit models: a novel ocular microdialysis technique. J Ocul Pharmacol Ther. 12, 209-224 (1996). Ahn, J., et al. Pharmacokinetics of Intravitreally Injected Bevacizumab in Vitrectomized Eyes. J Ocul Pharmacol Ther. (2013). Park, S. J., et al. Intraocular pharmacokinetics of intravitreal vascular endothelial growth factor-Trap in a rabbit model. Eye (Lond). 29, 561-568 (2015). Jager, R. D., Aiello, L. P., Patel, S. C., Cunningham, E. T. Risks of intravitreous injection: a comprehensive review. Retina. 24, 676-698 (2004). Durairaj, C., Shah, J. C., Senapati, S., Kompella, U. B. Prediction of vitreal half-life based on drug physicochemical properties: quantitative structure-pharmacokinetic relationships (QSPKR). Pharm Res. 26, 1236-1260 (2009). Ahn, S. J., et al. Intraocular pharmacokinetics of ranibizumab in vitrectomized versus nonvitrectomized eyes. Invest Ophthalmol Vis Sci. 55, 567-573 (2014). Mochizuki, K., et al. Intraocular kinetics of ceftazidime (Modacin). Ophthalmic Res. 24, 150-154 (1992). Bakri, S. J., et al. Pharmacokinetics of intravitreal ranibizumab (Lucentis). Ophthalmology. 114, 2179-2182 (2007). Kondo, T., Miura, M., Imamichi, M. Measurement method of the anterior chamber volume by image analysis. Br J Ophthalmol. 70, 668-672 (1986). Toris, C. B., Yablonski, M. E., Wang, Y. L., Camras, C. B. Aqueous humor dynamics in the aging human eye. Am J Ophthalmol. 127, 407-412 (1999). Remtulla, S., Hallett, P. E. A schematic eye for the mouse, and comparisons with the rat. Vision Res. 25, 21-31 (1985). Barza, M. Animal models in evaluation of chemotherapy of ocular infections. Experimental Models in Antimicrobial Chemotherapy. Zak, O., Sande, M. A. Harcourt Brace Jovanovich. 187-211 (1986). Hughes, A. A schematic eye for the rat. Vision Res. 19, 569-588 (1979). Maurice, D. M., Mishima, S. Ocular pharmacokinetics. 69, Springer Verlag. (1984). Greenbaum, S., Lee, P. Y., Howard-Williams, J., Podos, S. M. The optically determined corneal and anterior chamber volumes of the cynomolgus monkey. Curr Eye Res. 4, 187-190 (1985). Ruby, A. J., Williams, G. A., Blumenkranz, M. S. Vitreous humor. Foundations of Clinical Ophthalmology. Lippincott Williams & Wilkins. (2006). Jaffe, G. J., Ashton, P., Andrew, P. Intraocular Drug Delivery. Taylor & Francis. (2006). Iyer, M. N., et al. Clearance of intravitreal moxifloxacin. Invest Ophthalmol Vis Sci. 47, 317-319 (2006). Fauser, S., et al. Pharmacokinetics and safety of intravitreally delivered etanercept. Graefes Arch Clin Exp Ophthalmol. 242, 582-586 (2004). Scholes, G. N., O'Brien, W. J., Abrams, G. W., Kubicek, M. F. Clearance of triamcinolone from vitreous. Arch Ophthalmol. 103, 1567-1569 (1985). Stastna, M., Behrens, A., McDonnell, P. J., Van Eyk, J. E. Analysis of protein composition of rabbit aqueous humor following two different cataract surgery incision procedures using 2-DE and LC-MS/MS. Proteome Sci. 9, 8 (2011). Sinapis, C. I., et al. Pharmacokinetics of intravitreal bevacizumab (Avastin(R)) in rabbits. Clin Ophthalmol. 5, 697-704 (2011). Gaudreault, J., Fei, D., Rusit, J., Suboc, P., Shiu, V. Preclinical pharmacokinetics of Ranibizumab (rhuFabV2) after a single intravitreal administration. Invest Ophthalmol Vis Sci. 46, 726-733 (2005). Maurice, D. Review: practical issues in intravitreal drug delivery. J Ocul Pharmacol Ther. 17, 393-401 (2001). Laude, A., et al. Intravitreal therapy for neovascular age-related macular degeneration and inter-individual variations in vitreous pharmacokinetics. Prog Retin Eye Res. 29, 466-475 (2010). Christoforidis, J. B., Carlton, M. M., Knopp, M. V., Hinkle, G. H. PET/CT imaging of I-124-radiolabeled bevacizumab and ranibizumab after intravitreal injection in a rabbit model. Invest Ophthalmol Vis Sci. 52, 5899-5903 (2011). Sangwan, V. S., Pearson, P. A., Paul, H., Comstock, T. L. Use of the Fluocinolone Acetonide Intravitreal Implant for the Treatment of Noninfectious Posterior Uveitis: 3-Year Results of a Randomized Clinical Trial in a Predominantly Asian Population. Ophthalmol Ther. 4, 1-19 (2015). Bajwa, A., Aziz, K., Foster, C. S. Safety and efficacy of fluocinolone acetonide intravitreal implant (0.59 mg) in birdshot retinochoroidopathy. Retina. 34, 2259-2268 (2014). Sanford, M. Fluocinolone acetonide intravitreal implant (Iluvien(R)): in diabetic macular oedema. Drugs. 73, 187-193 (2013). Haller, J. A., et al. Dexamethasone intravitreal implant in patients with macular edema related to branch or central retinal vein occlusion twelve-month study results. Ophthalmology. 118, 2453-2460 (2011). Boyer, D. S., et al. Three-year, randomized, sham-controlled trial of dexamethasone intravitreal implant in patients with diabetic macular edema. Ophthalmology. 121, 1904-1914 (2014). Patel, S. R., et al. Targeted administration into the suprachoroidal space using a microneedle for drug delivery to the posterior segment of the eye. Invest Ophthalmol Vis Sci. 53, 4433-4441 (2012). Makadia, H. K., Siegel, S. J. Poly Lactic-co-Glycolic Acid (PLGA) as Biodegradable Controlled Drug Delivery Carrier. Polymers (Basel). 3, 1377-1397 (2011).